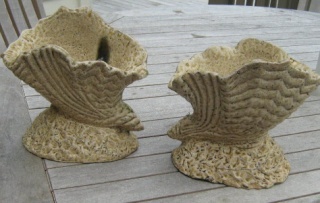 Salt glaze shell urns - anyone help ?? Hi I am trying to find out about these two items. They are roughly made, and unfortunately both are a little damaged. The clay underneath is the same colour as the glaze. PS. how do you upload photographs onto your profile or so they actually appear on the text ?? Re: Salt glaze shell urns - anyone help ?? Thanks so much. Getting there. » Mark Smith Ceramics - Rocester.